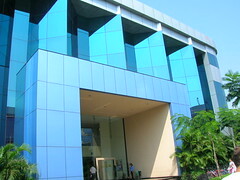 Infosys Technologies Ltd. is a global leader in the IT consulting space with more than 100,000 employees worldwide and revenues of over US$ 4.8 billion. Infosys defines, designs and delivers technology-enabled business solutions that help Global 2000 companies win in a Flat World. Infosys also provides a complete range of services by leveraging domain and business expertise and strategic alliances with leading technology providers. Understanding that buildings are the largest consumers of energy, Infosys undertook an aggressive plan to design all new buildings as green buildings, and making all existing buildings more energy efficient. 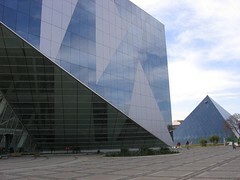 Infosys is taking steps to ensure that all upcoming buildings of the company are gold rated per the LEED (Leadership in Energy and Environmental Design) norms, the highest certification for energy-efficient buildings (like the Jaipur campus which would have 40% of the area as a green belt). Enabling maximum usage of natural light by measuring the performance of walls and windows in absorbing heat. Reduction in cooling requirements by using right building design and alignment that reduces ambient heating by sunlight. Deploying sensors to automatically turn off lights, monitors, and IP phones when employees are not at their desks and conference room management solutions which automatically turn off all electrical appliances and lights when not in use (30% savings in terms of energy consumption). Smart Data Center' initiative that minimizes the use of air conditioning units that are required to cool down the servers. Developing a software solution that manages the carpooling system through personalized information and alerts. All such initiatives realize huge costs savings without any compromise in consistency of performance and delivery. The estimated environmental impact reduction of the Green IT ideas is equivalent to planting 4,000 trees and removing 244 cars off the road. Unlike most Indian firms which are content with virtualisation or consolidation initiatives, Infosys' has managed to design a completely integrated green initiative. Reaching the target of going carbon neutral by 2012 is yet to be seen but all such initiatives would go a long way in setting standards for business sustainability.